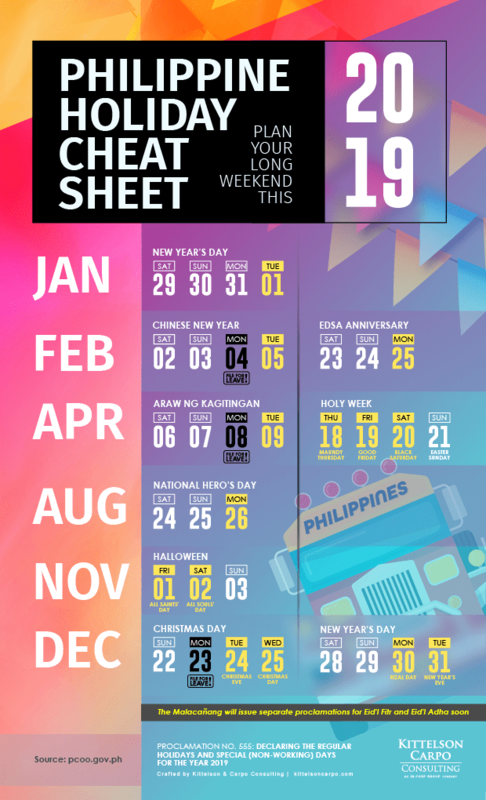 Generally, no fixed list of holiday dates in the Philippines can be provided because some holidays are movable. However, the President is tasked by law under the provisions of Republic Act 9492 to issue a Proclamation prior to their occurrence to finalize the specific date of their observance. *Note: Official announcement from the Office of the President for the specific dates for Eid’l Fitr and Eid’l Adha will be issued after approximate dates of these Islamic holidays have been determined (in accordance with the Islamic calendar Hjira, the lunar calendar or upon Islamic astronomical calculations, whichever is possible or convenient).